Yesterday was so absolutely gorgeous…it literally took my breath away! There was not a cloud to be seen in the bluest of azure skies…it felt more like a typical late October blue than a February one. With little or no humidity… walking around town was like a 3-D experience or a pop-out greeting card come to life. 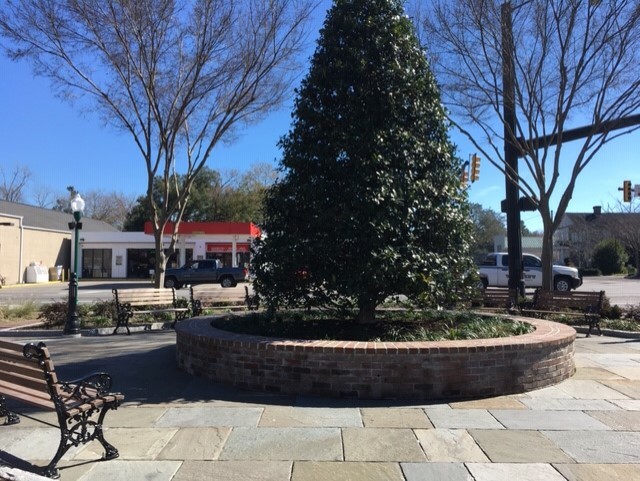 I decided I must return to Hutchinson Square and sit down and relax… thinking back on the history of this park located in the center of town…named for Summerville’s first mayor Edward L. Hutchinson. It didn’t take long for this quaint village retreat to become popular. 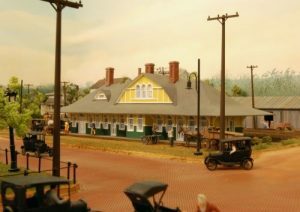 By 1830 the South Carolina Railroad came through Summerville and a new town plan was laid out with streets parallel and perpendicular to the tracks for easy travel access. 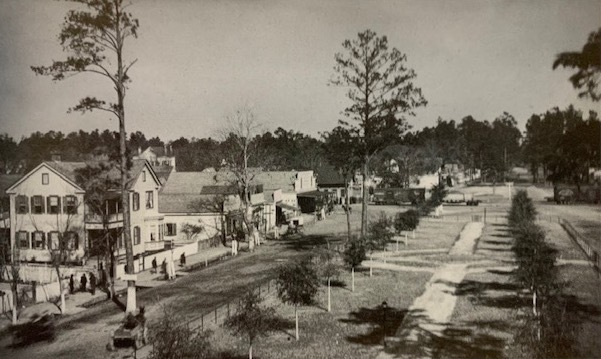 The “new town,” as it was called, was just east of the original settlement of Old Summerville and Mayor Edward L. Hutchinson became its first mayor. *Several times in my blog posts… I have mentioned that I wish our town would fix up this old square and add an old-fashioned Victorian bandstand/pavilion for entertainment and speeches….to provide many more benches, plants, flowers,fountains, statues, and trees. And my wish is coming true! (Photo: Images of America Summerville by Jerry Crotty & Margaret Ann Michels.) The original train depot, dating back to the 1880’s had a classic Victorian style building with elaborate gingerbread trim. 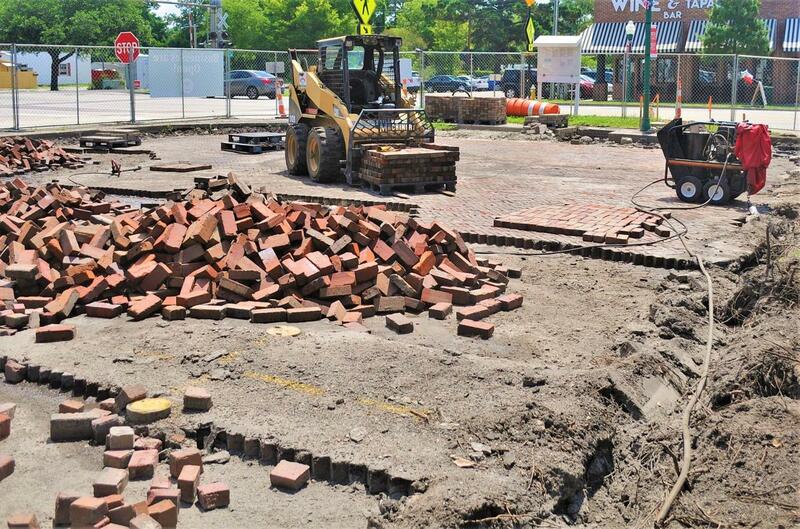 (Resource: Flowertown Realty- Susan Gardner- “Hutchinson Square-History and Renovation Update”) *Great research! “The road was paved with bricks shortly thereafter, as seen in the photo dating back to 1916 with T model cars and horse and buggy. The train station was a landmark in Summerville at that time and many business men commuted back and forth to Charleston daily. 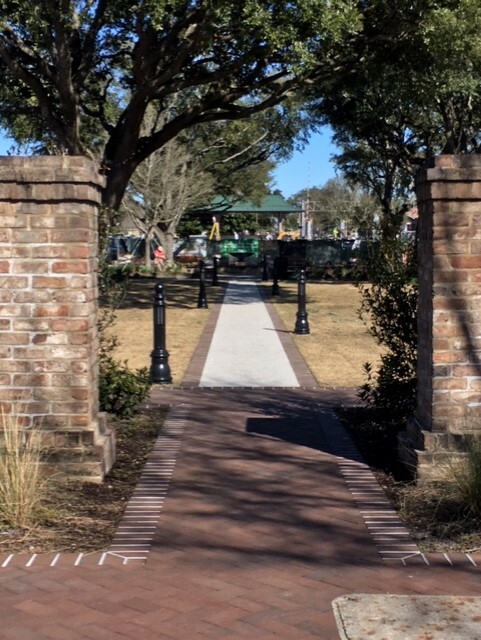 It is so nice to have a central walk-way that will connect the park from end to end….the tree and sitting area (title photo) to the middle (the fountain) to the replica of the old train depot, now the pavilion. The pavilion and surrounding area is the last section to be completed but every day, while driving by, there are signs of progress and the excitement builds! It is scheduled to be finished by the end of the month. I can’t stop the post here without adding a bizarre legend concerning the original Summerville train depot. Every year around Halloween my students would always talk about the “lights” on the railroad tracks running through Summerville… accompanied by screams of fear. The stories varied somewhat but I think the legend probably originated from the largest earthquake to hit the southeast….destroying many buildings in Summerville and Charleston area…August 31, 1886. Out of this horrific calamity of nature came an old Summerville story… concerning a train coming through Summerville the night of the earthquake and the miracle that saved it. It was 9:45 p.m.. August 31, 1886. 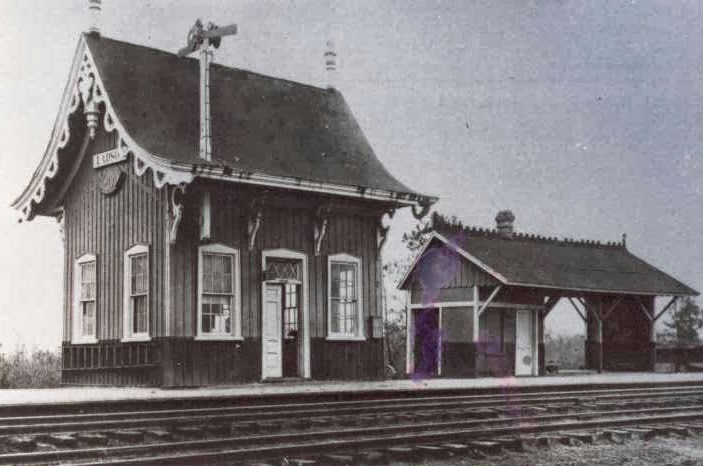 A commuter train that had just passed Jedburg was due to arrive in the Summerville station within a few short minutes.Frank Doar, the station master, was half asleep waiting on its arrival. Suddenly he felt himself being shaken by an elderly black man who excitedly told him that the tracks farther up the line were twisted so badly it would derail the train. Frank had to send out the flares, called torpedoes back then, to warn the engineer and the train’s passengers. Normally Frank would have asked more questions before reacting but there was something about this man, who appeared out of no where, that made him believe he was telling the truth. Immediately he sent the flares out into the night and then turned around to thank the unexpected messenger/visitor but no one was there. He had vanished. At 9:50 the earthquake struck…walls of buildings began toppling, large trees were uprooted and the engineer was desperately trying to slam on brakes but to no avail…the waves coming from the quakes was making the train go faster and faster. He looked up and saw the flares coming at the train and once again hit the brakes as hard as he could…the train miraculously started slowing down and stopped one mile before their approach into Summerville. Everyone was terrified but all had survived. When it was light enough to see the next morning everyone walked up the track and just a few miles away the quake had twisted the tracks into a “S” shape which would surely had derailed the speeding train. Frank Doar was proclaimed the hero of that famous incident…but he refused any accolades…he said it was the elderly man who saved that train…but no one knew him or had seen anyone like the person Frank described…Frank then decided the stranger was indeed an angel and as such deserved everyone’s prayers and blessing of thanks. So until tomorrow….Let us always remember to look forward but to also never forget the past….the foundation on which each generation stands…and learns from its history. 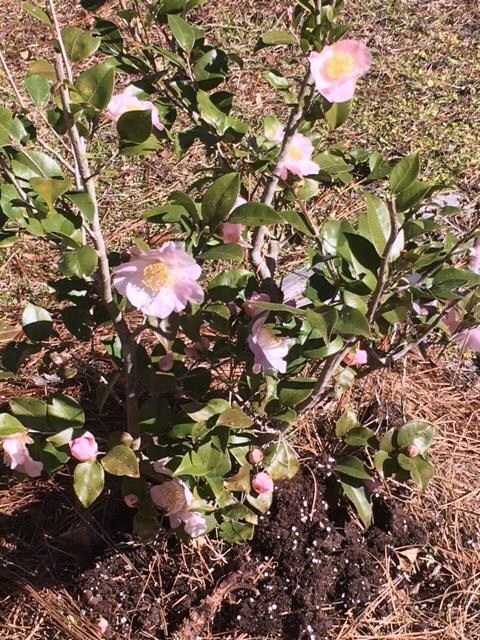 It’s camellia season in the lowcountry…all the famous plantations are having special events built around this beautiful, glorious and historical lowcountry flower. 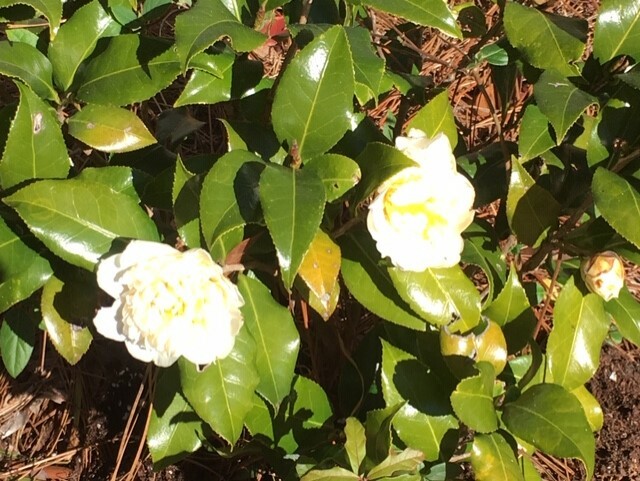 However, I need not leave my home or yard to find the same beauty. 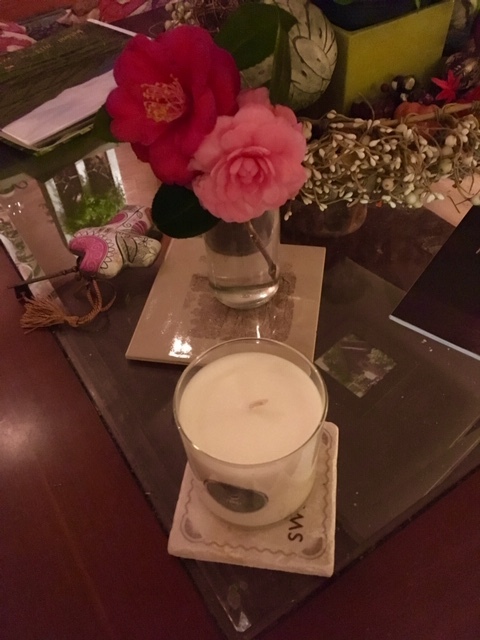 Gin-g ran by yesterday with a Valentines cookie and a camellia which she added to one vase….what a beautiful season of the year! 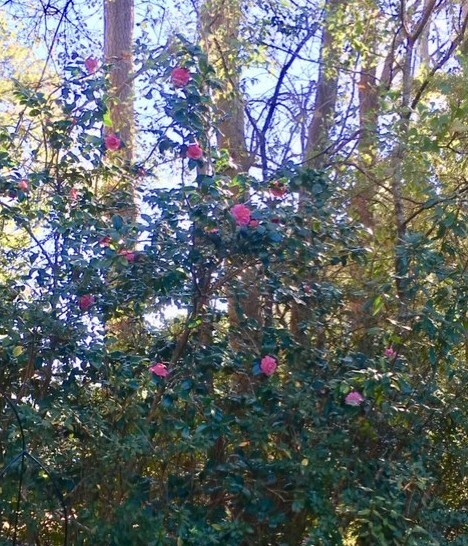 My camellia “tree” is right outside my window when I type…it never fails to lift my spirits. Oh my what a story. Isn’t it wonderful summerville is being rebuilt. Mentone. Ala.was a get-a-way little town and is still a summer place for a lot of people. We lived there for several years before moving back to Mississippi. It is still a special place to me. My son is buried there and I still have friends there. One dear family owns the Old Carolina Brick works. They may use some of them in the rebuilding. Connections everywhere! Glad you enjoyed the story…you can tell I miss teaching our state and regional history as well as any kind really.. Thanks for sharing.!!! I am returning to my hometown to visit mother’s grave shortly…it is always bittersweet. I have read the stories of the earthquake, the Summerville light, etc. so many times, but I never get tired of hearing our history told. This may be one of my favorite blogs ever. Talk to Deb sometimes about the Summerville light which she claims to have seen and can tell you where they went to see it. Thanks for the pictures of then and now. I don’t think I had ever seen the one of Ladson depot. I remember the other one so well, and since my aunt lived where Y parking lot is, I watched that train come through town about 11 o’clock many nights. It always had some passenger cars as I remember it. Thanks for the memories and the update on the Square. 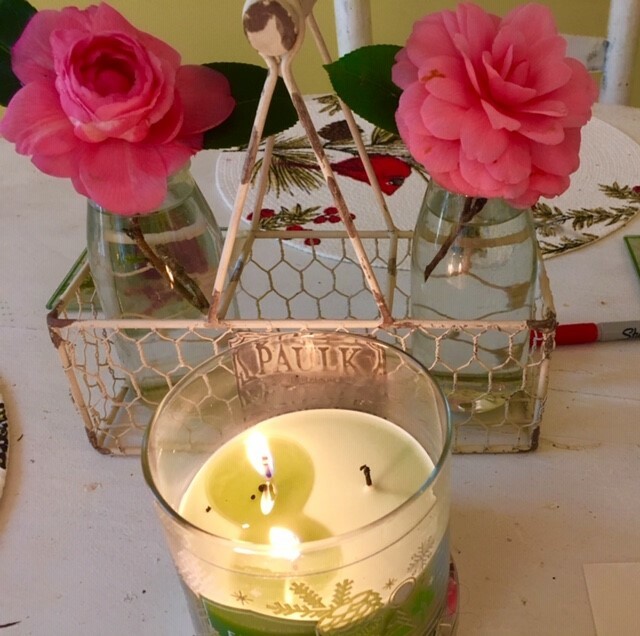 I was thinking of you Jo…as I was working on this post yesterday…must hear about the summerville light from Debbie….WOOOOOOOOO! Spooky!